On the Sunday after Ash Wednesday, when the fasnacht confetti is still lying on the ground, Zug comes alive with a different sort of music. Not the big rousing brass band guggnemusic from Fasnacht, but from small singing groups serenading couples who are celebrating their love. It’s called Chrööpeflimee and it must be the sweetest tradition on the Zug cultural calendar. The tradition’s history dates back to the 1840’s and has evolved over the years. According to the Zug edition of the Swiss Kantons Encyclopedia from 1975, the tradition started out when the girls of Zug would invite their new male friend they met over the festive fasnacht period to cook for them. Their friends, in support of the new relationship, would sing for the couple and in return would be served the sweet but hearty Fasnacht Chrööpfeli. For the guests who were not just satisfied with one Chrapfen, they would shout “mee Chrööpfeli” or “more Chrapfen” and so the tradition of Chrööpfelimee began. What are Chrapfen, you might ask? The website for Swiss culture translated them to “donuts”, and while they are a filled sweet treat - this translation is quite far off from what we English speakers would call a donut. Chrapfen are a speciality item popular at this time of year and are made from flaky dough filled with a dried pear paste. If you want to try one yourself during Chrööpfelimee, look out for the local women’s groups selling glühwein with an accompanying Chrööpfeli in the middle of the old town. Or you will undoubtedly see the local bakeries selling these seasonal treats well. The tradition of Chrööpfeli has changed dramatically over the years. What once was a more personalized event with groups organizing their route based on where their newly married friends were, today’s celebration is more organized and a little less personal. With the fear that the tradition would stop, the organizers, the tailor guild of Zug who took over the organising the event in 2008, broadened the serenading criteria. With their help, couples in Zug and Oberwil can now participate, and not just newlyweds. I read in the local newspaper that this year’s couples even included those celebrating their 25th wedding anniversary. What is lost in personalization is gained by the community because it has evolved into something for everyone who loves music and tradition to enjoy. 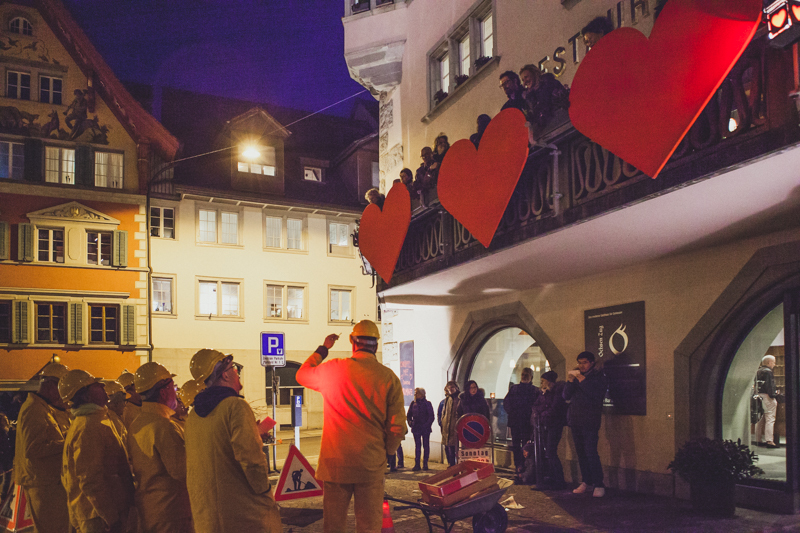 I wandered the streets of the old town of Zug from one decorated window to the next to enjoy the performances from more professional choirs, as well as groups who came together for the sole purpose of performing that evening. The songs ranged from the more traditional to modern acoustic classics. Each group moves from window to window and has a scheduled time to perform at the Hotel Ochsen where the happy couples watch the performances of the groups below from its heart-decorated balcony. The yellow-jacket men’s group, Jodel AG, was one of my favourites this year; their songs were a little less formal and they were combined with a touch of humour which brought laughter into the night air. They had cleverly reworded popular songs into Swiss-German, with lyrics that had them wishing for more wine and chrööpfeli. It was also a delight to hear the more professional choirs such as Xang and the angelically dressed Tonique - the singing ladies. But my hat goes off to the brave people dressed like what looked like a water polo team who withstood the cold and windy day while singing in their Speedos! What hasn’t changed over the years is how the singers are rewarded for their seranades. At the end of their performance, a basket is lowered from where the couple are perched that is filled with those delicious chrapfen and a bottle of wine. So next year, be sure to reserve your evening starting at 5.30pm the Sunday after Ash Wednesday (1 March 2020) for next year’s Chrööpfelimee. 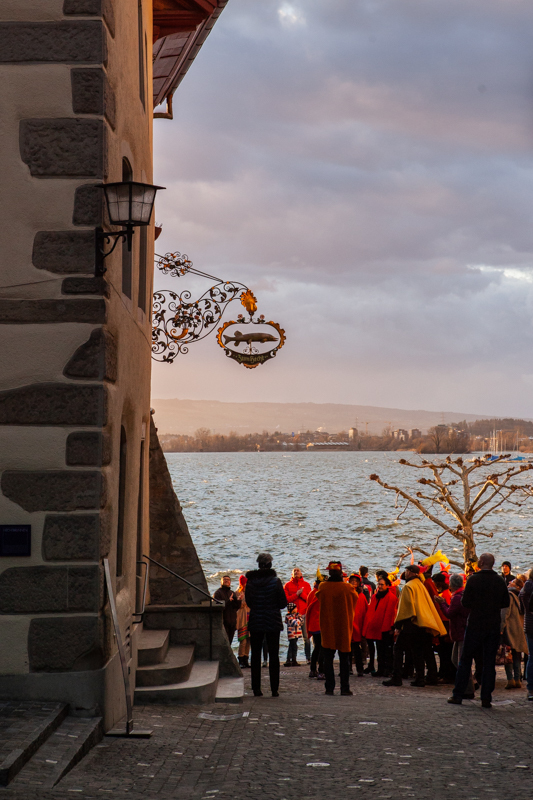 Be sure to come wrapped up warm and spend a couple of hours enjoying this lovely Zug tradition! Can’t wait till next year? Here is my video of the evening.